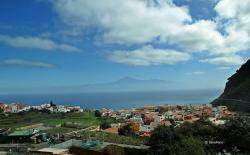 Get to know the municipality of Agulo in La Gomera. Agulo is a municipality located on the north of La Gomera, that belongs to the province of Santa Cruz de Tenerife, in the Canary Islands. Agulo is a picturesque municipality, opened to the Atlantic sea and that always includes the El Teide peak on its scenery. This is the smallest municipality in La Gomera, located at the end of a big basalt wall forming a beautiful green balcony over the sea. Its composed by three nuclei, la Montañeta, Las Casas and El Charco. 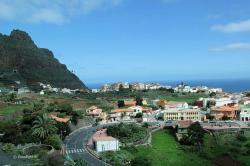 The town of Agulo is considered the “Bombom” of La Gomera due to its undisputed and attractive appearance. Agulo has many endearing stoned streets and precious tiled houses with kitchen-gardens all around. If you have the chance of being in this singular municipality don’t miss visiting some of the most relevant sites as the Abrante’s Viewpoint, the Montaña del Dinero and Roque Blanco, the San Marcos Church, the Roque Blanco Natural Monument and the Juego de Bolas Visitor’s Centre.